With more than a decade of experience serving local motorists and commercial organisations, we are capable of meeting all your vehicle transportation needs in Wangara. We pride ourselves on our ability to move vehicles of all types across the city at a moment’s notice and have many satisfied customers in the area. One of the reasons our services are so popular with local residents and businesses alike is that we treat each vehicle we transport as if it were our own and take great care to ensure that the valuable cargo our customers entrust us with on a daily basis is delivered safely and in a timely manner. If you need a tow truck in Wangara and you refuse to settle for second best, call Executive Towing Services right now to request a competitive quotation. Every member of our team is fully qualified and experienced, and has undergone extensive training to ensure they are able to deliver the level of service that our customers have come to expect from us. Our tow truck operators have been checked by the local police and possess the licences and expertise required to move vehicles of all kinds in complete safety. Our experienced customer support agents have also been fully trained in our methods and are standing by ready to assist you. Whether you would like more information about the range of services we offer or you need an instant quotation for towing in Wangara, call now and speak to one of our local experts. While many vehicles can be safely transported with a standard tow truck in Wangara, heavily damaged cars should be transported on a tilt tray truck to avoid the possibility of further damage en route to the nearest repair centre. Excavators and other heavy machinery should also be transported on tilt tray trucks as this is the most safe and efficient way to do so. We have a fleet of well-maintained, modern tilt tray trucks, enabling us to transport both heavy machinery and accident damaged vehicles without any risk to the cargo in question or other road users. If you need to move a vehicle that needs be safely towed, call and book a tilt tray truck with Executive Towing Services. 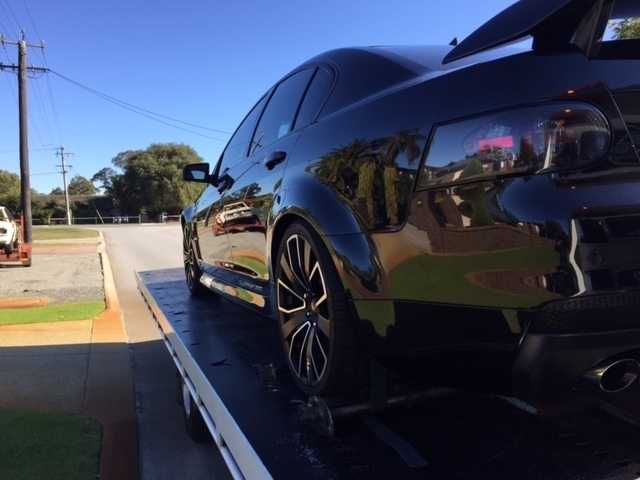 Thanks to our local knowledge and years of industry experience, we are able to offer fast and efficient towing in Wangara that you can rely on completely. While it is advisable to book in advance if possible, we are always happy to accommodate last-minute requests if we can and are proud to offer a highly responsive roadside assistance service to motorists and commercial clients who run into difficulties in this part of the city. If you need a tow truck and you need it now, pick up the phone and call us without delay. Once we know where you are and what type of transportation you require, we can provide you with an accurate quotation and expected time of arrival.